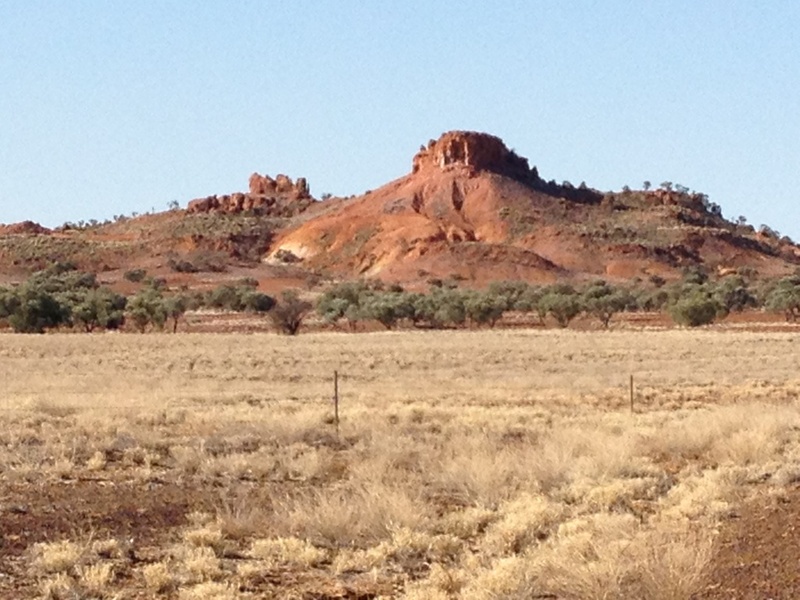 I headed off from Mt Isa on Monday 19th August to wend my way slowly back to the Gold Coast. 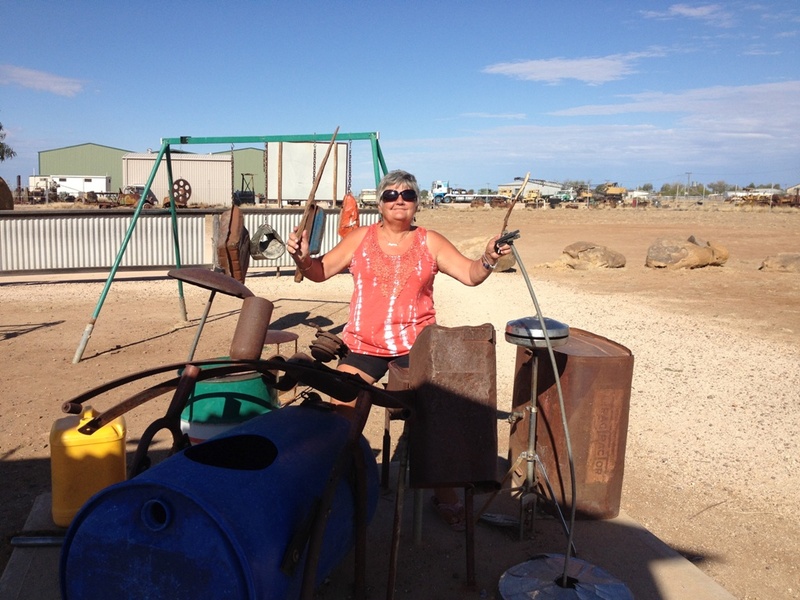 As Bev had taken me to McKinlay on Saturday I decided to go down through Boulia again. Although the road is only one lane it’s not a bad road and there was a tree I wanted to photograph that I saw when I went to the Camel Races. Isn’t it amazing? 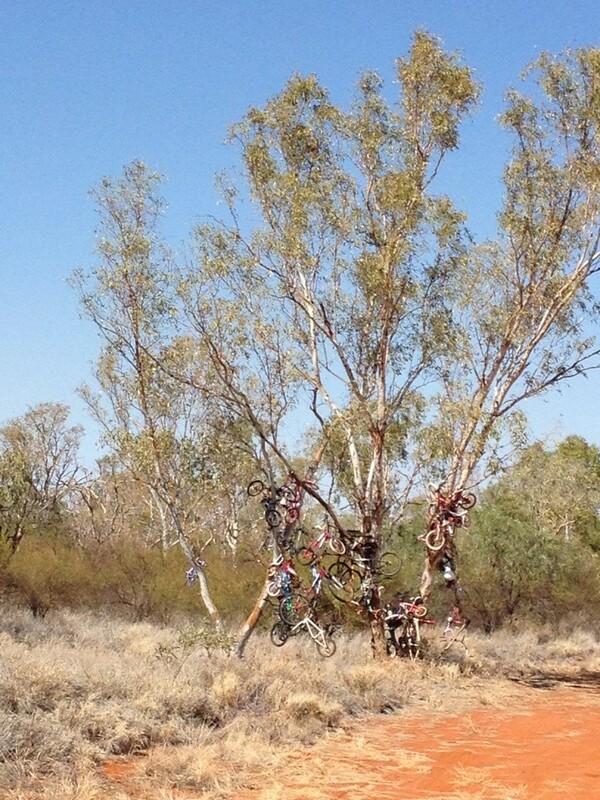 I wonder how they got all those bikes up there! Don’t you love the quirkiness of some people? I’m so glad I decided to go this way because at my very first overnight stop I met this wonderful lady, Rosanna and her dog Layla. She drives a fifth-wheeler called Zingara, which means gypsy, and has been on the road about 3 years. 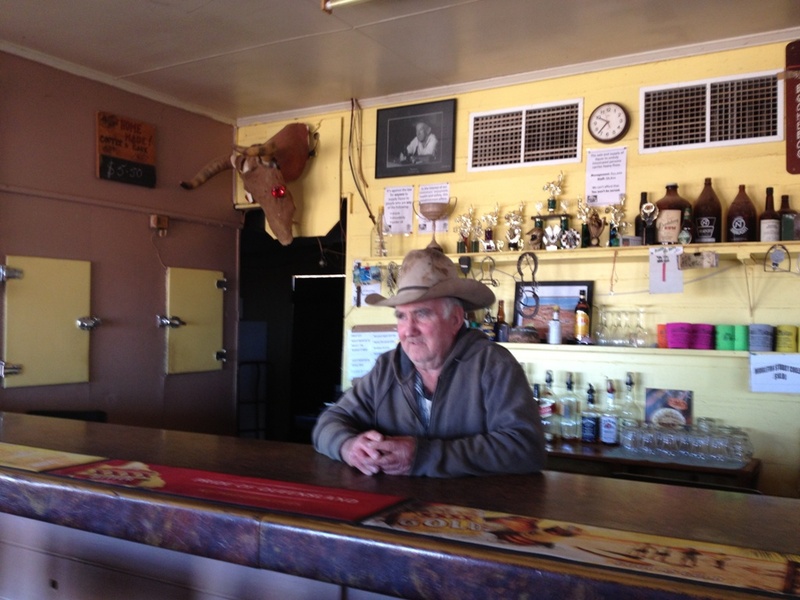 We had a drink together for happy hour and the next day we headed off together towards Winton. Rosanna had stopped at the Cawnpore Lookout and advises you to park at the bottom and walk up to see the most amazing view. The road is steep and not accessible by motorhomes and caravans. 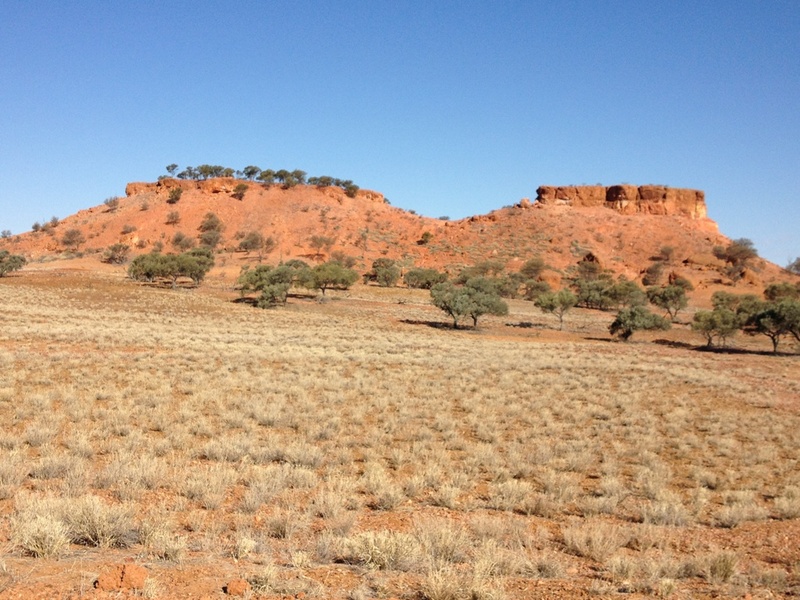 Here are some of the pictures of the landscape on the way between Boulia and Middleton. 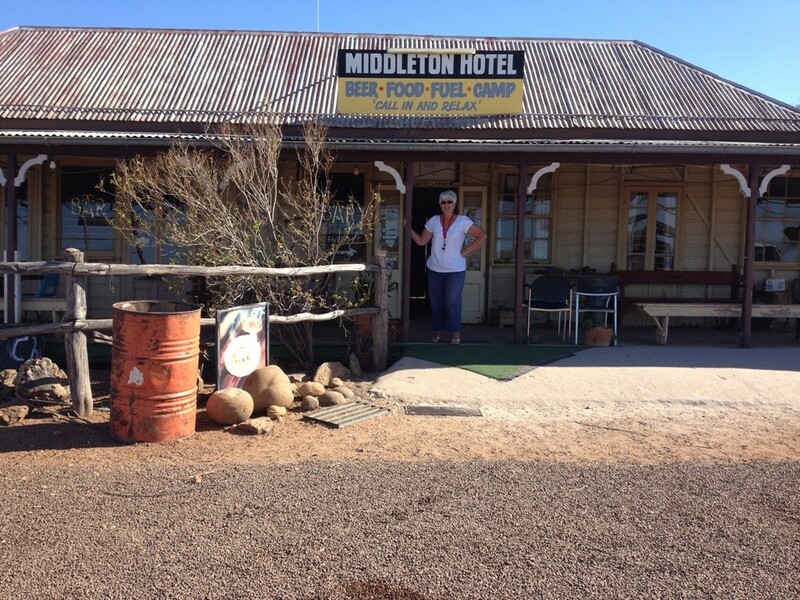 On the way we stopped at the Middleton pub, known as one of the most remote pubs in Queensland. There is a rest area opposite that you can camp at. There doesn’t appear to be anything else in Middleton but the pub, but that was well worth stopping at to meet the publican and his wife and their pets, Kelly the dog and Pig, the pig. 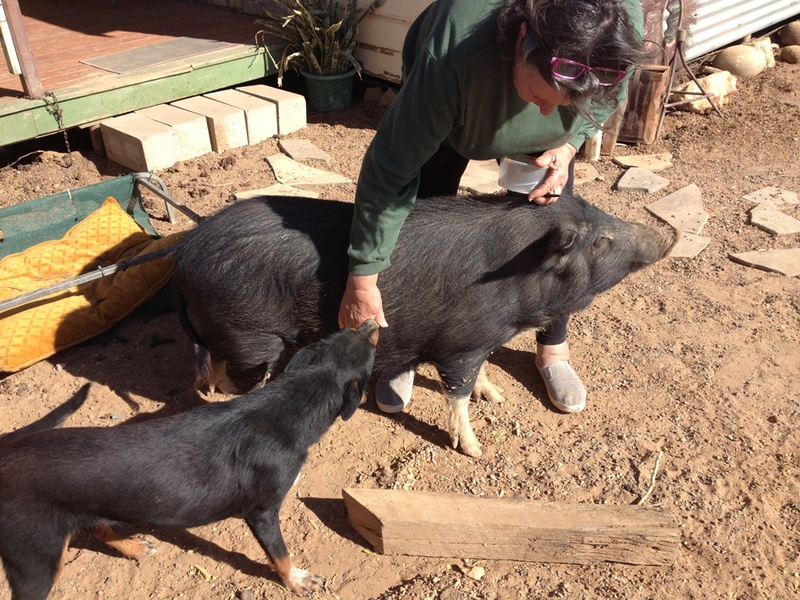 Pig has been raised there and thinks it is a dog so it goes out with Kelly to round up the cattle. There were some fabulous flat top hills called mesas, or locally known as jump-ups along the way. 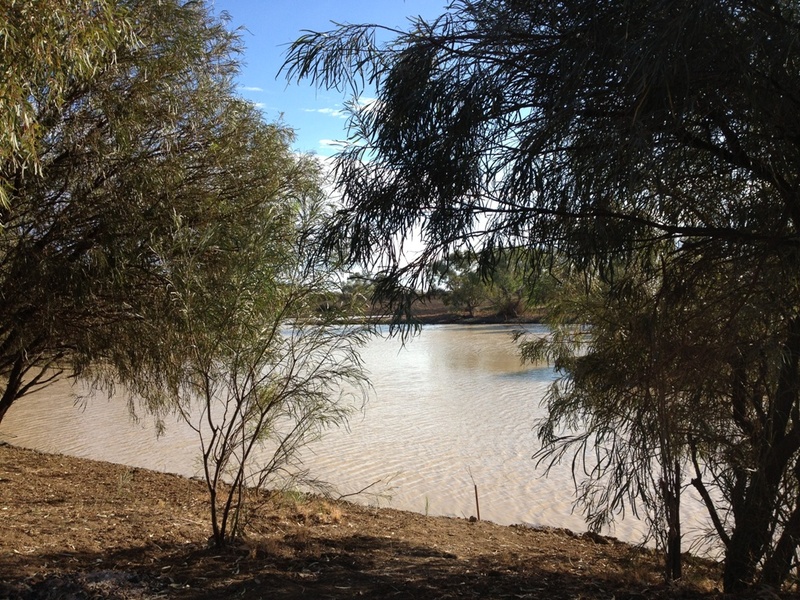 When we arrived in Winton we made our way to the Long Waterhole, about 4 kms out of town. 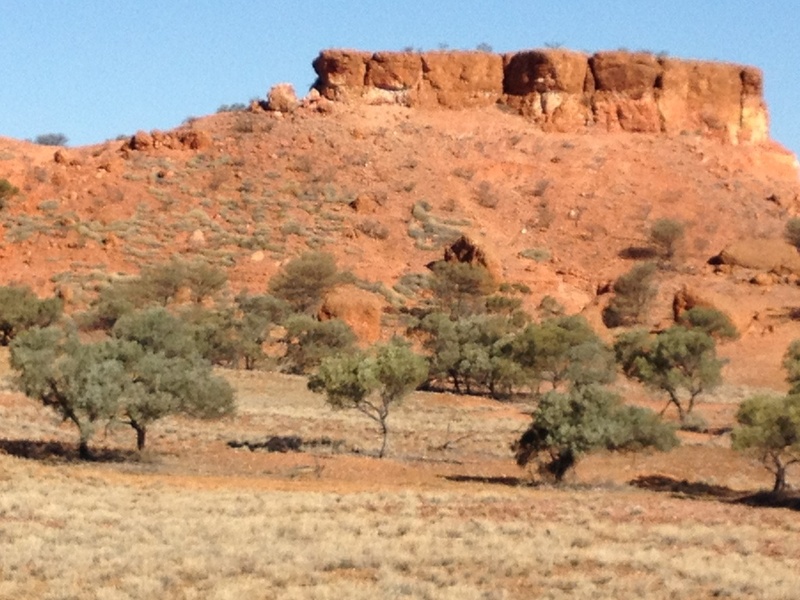 As we drove in I recognised Nev, another Solo I had met at Goomeri, so we pulled up close by and set up camp. 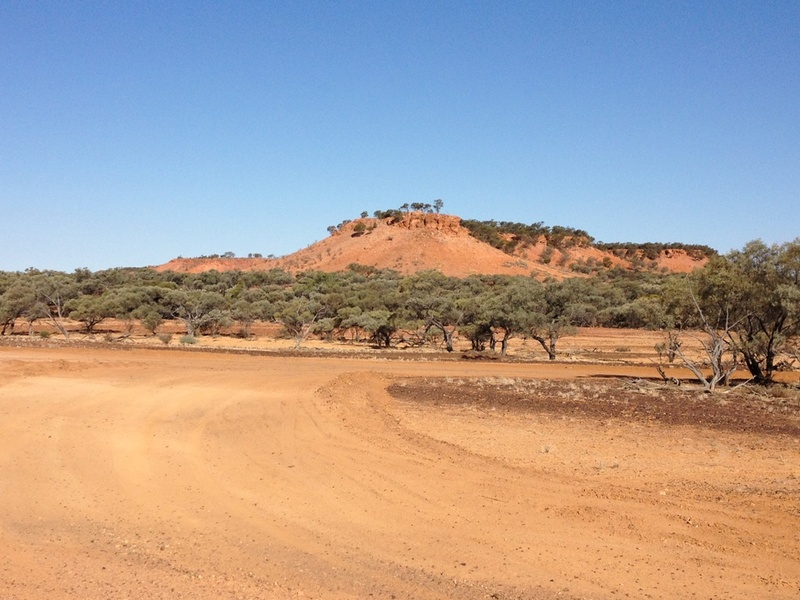 I’d only planned to stay a couple of days but Rosanna unhitched her ute and we set off to see the sights together so I ended up staying until Saturday morning. 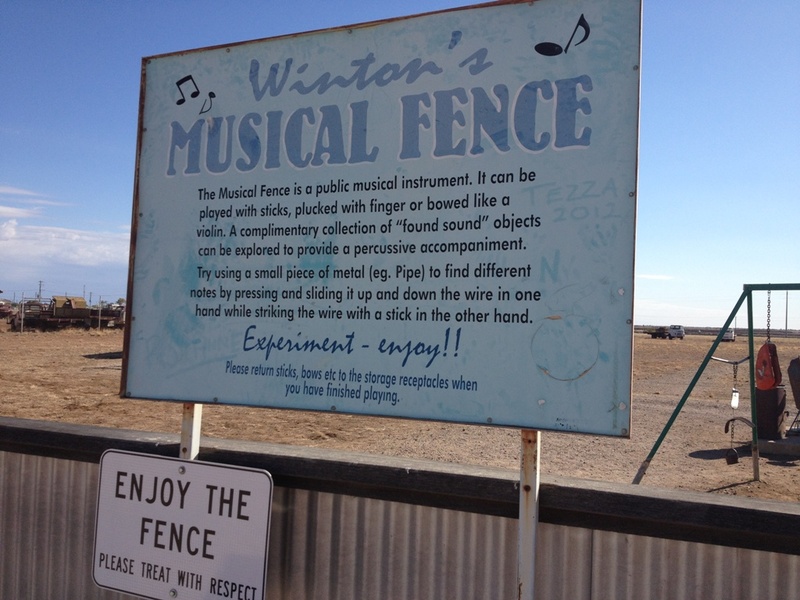 Winton is known as the home of Waltzing Matilda and their Information Centre has a fantastic display that illustrates the poem written by Banjo Paterson so long ago. Did you know that he heard the music first, then wrote words to go with it? I didn’t! 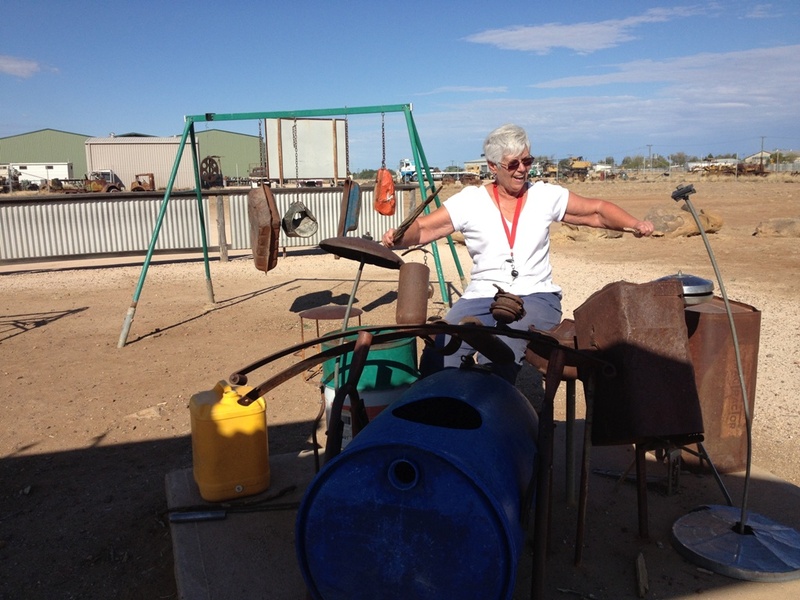 There are some interesting attractions at Winton, so we saw as many as we could. Arno’s Wall is one of them. 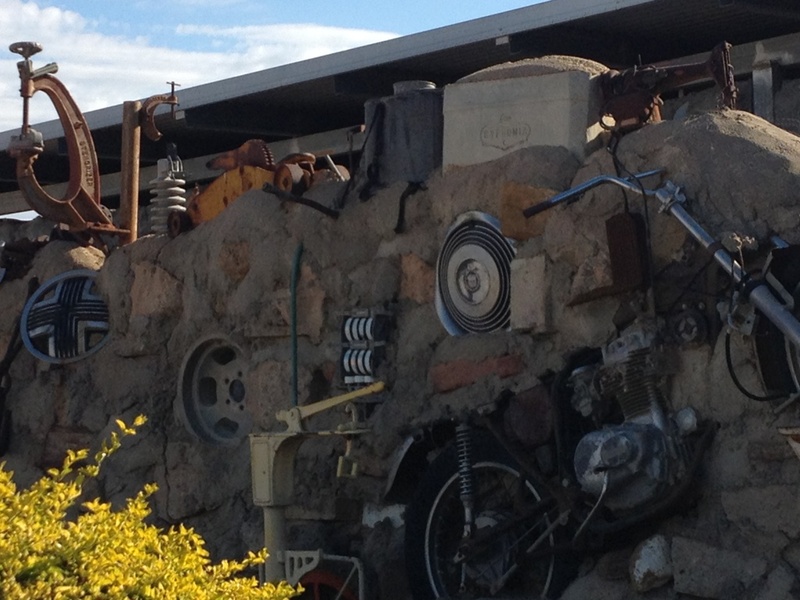 It was built from stuff from the rubbish tip cemented into a wall and there is everything there including the kitchen sink – and even a motor bike! Behind the historic Corfield and Fitzmaurice store there is also an old open air theatre with – you guessed it – the BIG deck chair. 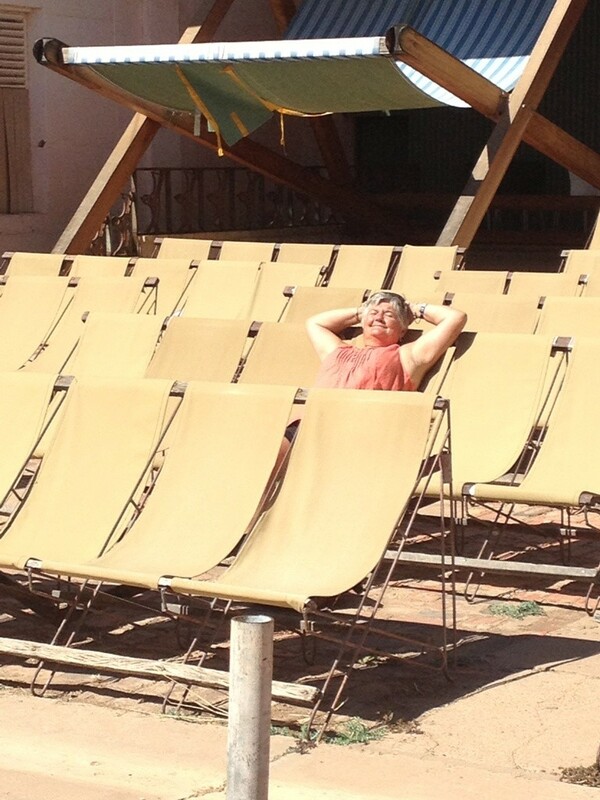 Here’s Rosanna relaxing! There is also a Musical Fence that you can play with sticks and pipes and they have set up a percussion area with assorted ‘stuff’. Had to have a go! 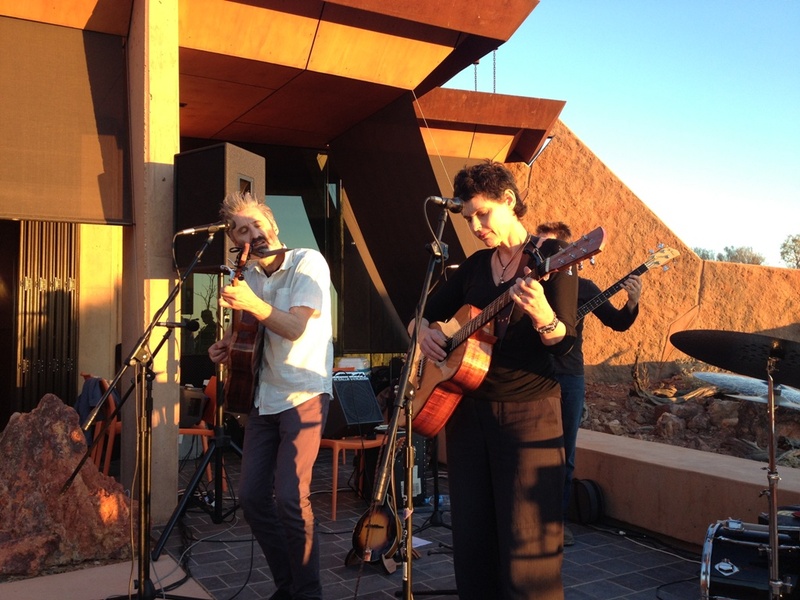 Rosanna and I took a couple of days to see all this – can’t rush these things – and enjoyed happy hour with Nev each night. On Thursday night Nev suggested we go into town to Tattersall’s hotel for tea, which we did and I enjoyed a massive rib fillet, cooked to perfection. Nev left on Friday after cooking us Eggs Benedict for breakfast – how spoilt are we – so Rosanna and I headed back into town to do some washing and get a haircut. 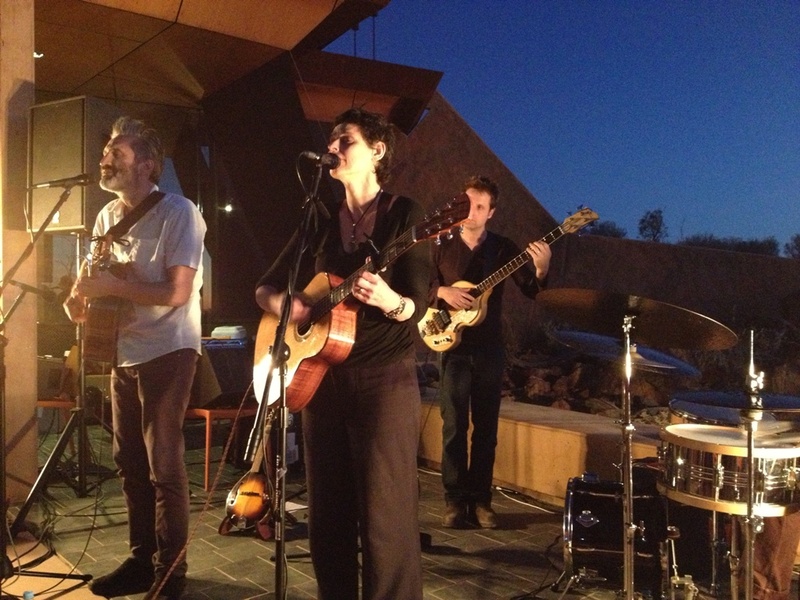 Lucky we did as the hairdresser at Pinky’s mentioned that Deborah Conway and Willy Zigier were performing out at the Age of Dinosaurs Museum that night so we decided we should go along. 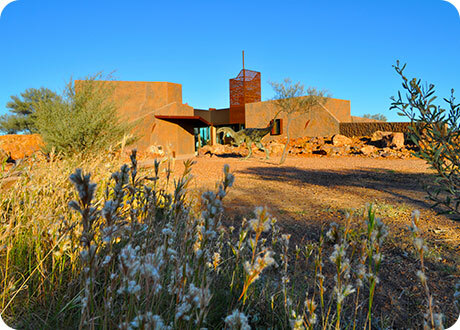 The museum is about 27kms from Winton, on a jump up (mesa), and is a stunning building in a stark and beautiful setting. We arrived before sunset, tables were set up on the terrace so we took the last one available which was directly in front of the little stage area. Off to the bar for a beer and we settled down to wait for the music, which was due to start at 6pm. 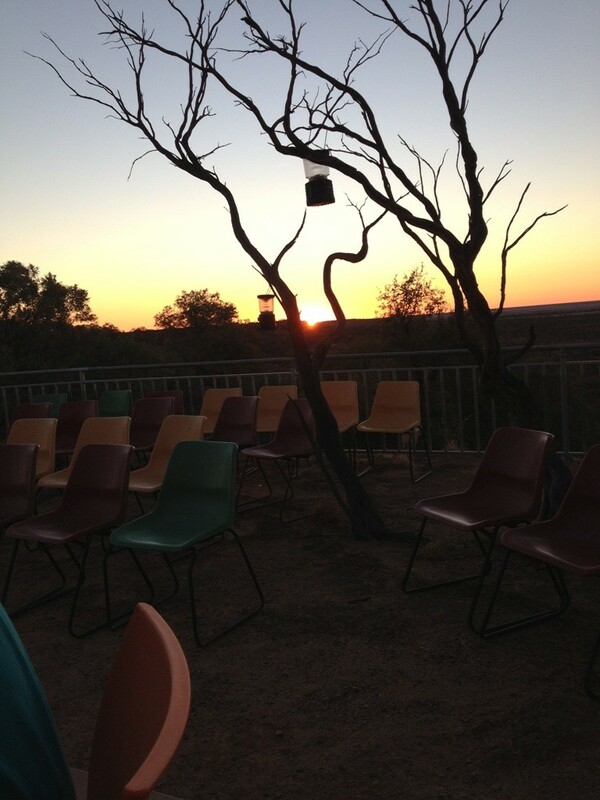 The sun set as the band was playing – absolutely magic! This was just one of those out of the blue experiences – being in the right place at the right time – and we were treated to a very special night. 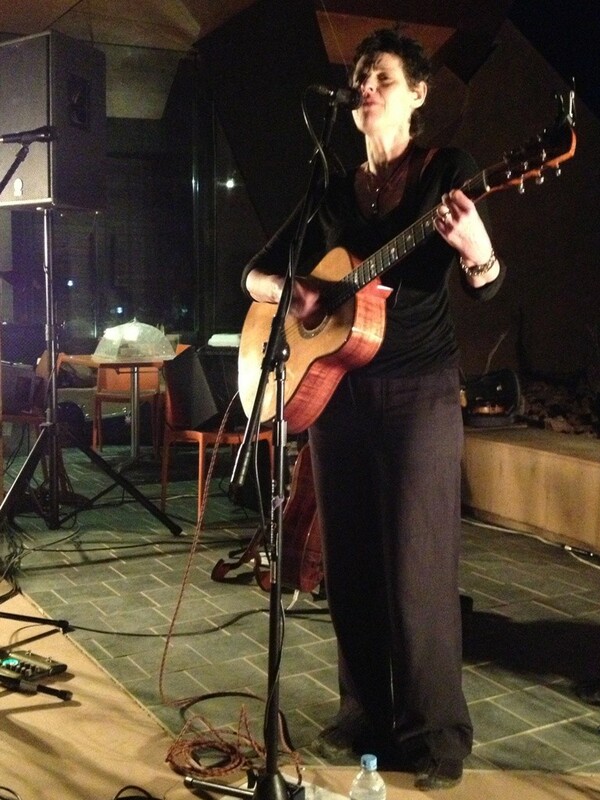 There would have been less than 50 people there, it was free, the setting was spectacular and the performance brilliant. It will be locked away in my memory forever. 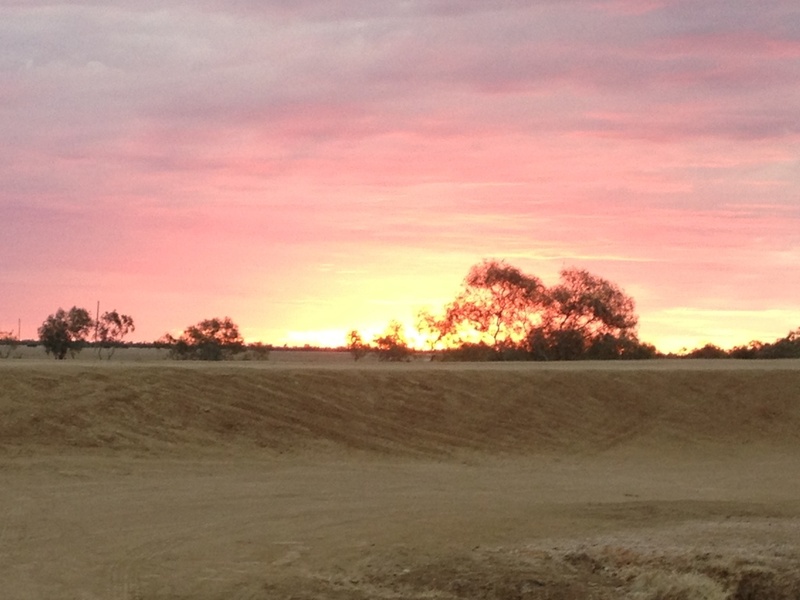 As we left you could see the lights of Winton in the distance. We headed back to our camp and enjoyed a farewell barbeque together as Rosanna was staying on and I was leaving the next morning. I’ll remember Winton fondly for the wonderful friend I made in Rosanna and the experiences we shared, particularly the magic music at the museum! There is a dump point in Winton and a large parking area for vans only one block back from the main street. 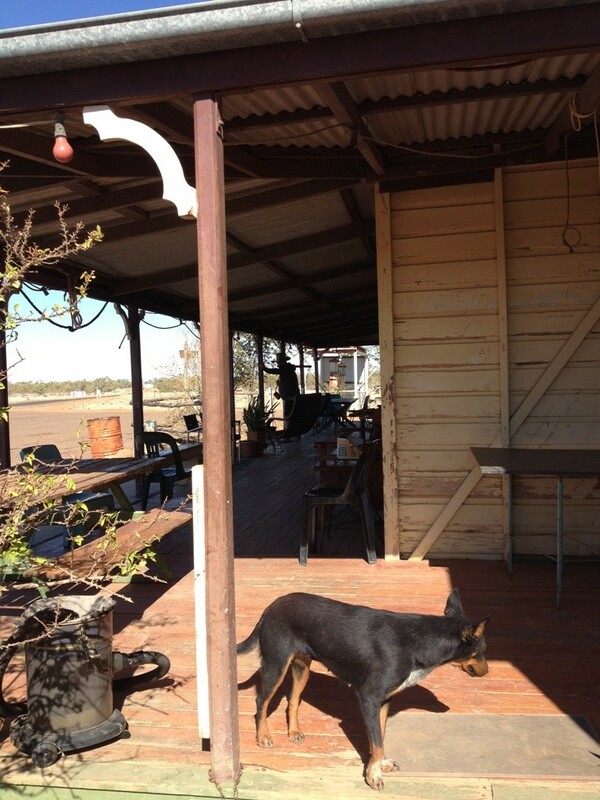 The Long Waterhole is about 2 kms out of town on the Jundah Road and camping is about 2kms in from the turnoff. There are no facilities at The Long Waterhole, but there was water in the creek and shady trees around. When I was there it was very windy, dry and dusty – couldn’t leave the windows open in the van or it just filled with dust. 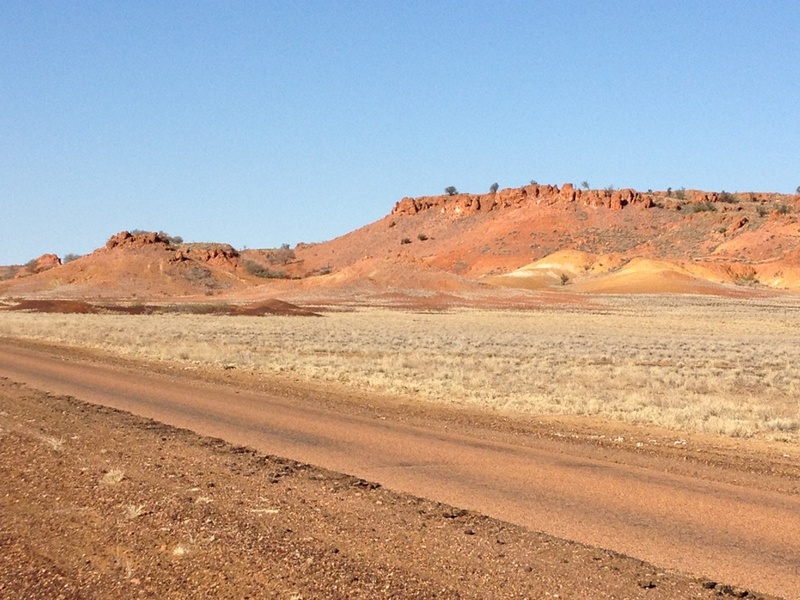 We were parked on the southern side of the waterhole and it may have been more protected on the northern side which is accessed by the ‘high’ road from the southern entry. Take your binoculars as there is a mass of birdlife and emus wander through the camp. 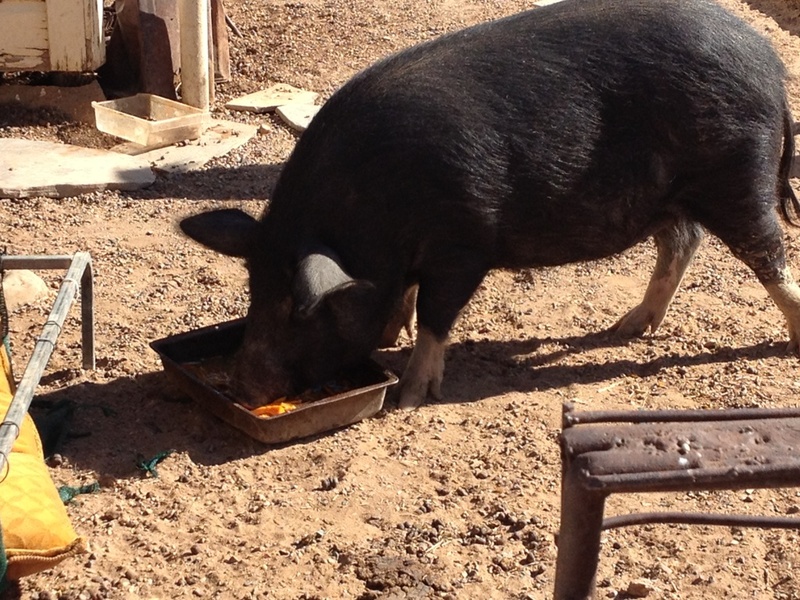 Don’t leave food lying around as there are also feral cats. 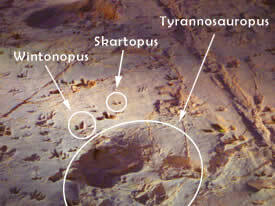 The only known dinosaur stampede in the world happened at Lark Quarry conservation park, about 110kms south west towards Jundah – 55 kms of made road and 55kms of dirt. You have to do a tour to see the stampede, where over 3300 footprints of dinosaurs of all sizes are preserved in stone. You can catch a bus out from town for $75 which includes the cost of the tour or you can drive yourself. Australian Age of Dinosaurs at the Jump Up. It houses the world’s largest collection of Australian dinosaur fossils and the most productive fossil preparation laboratory in the Southern Hemisphere. 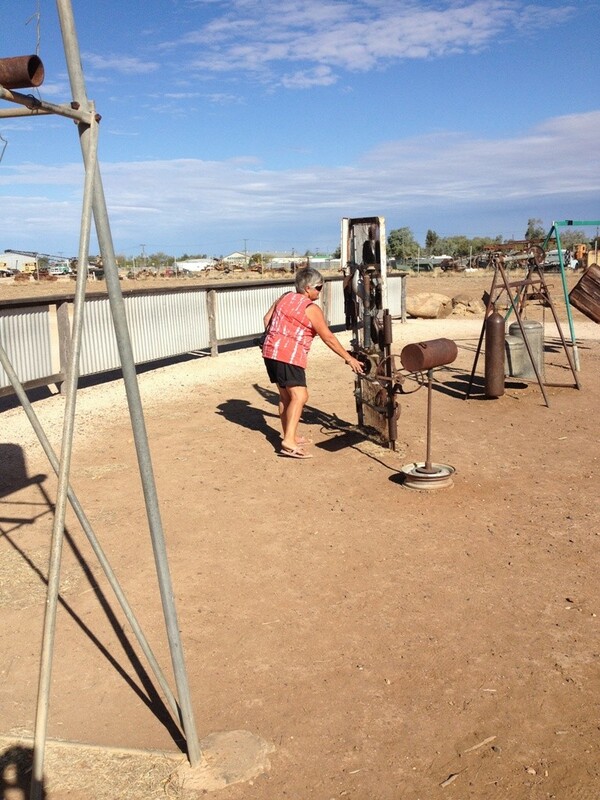 The turn off is 13kms south of Winton on the Longreach Road and then 13kms of dirt road to get to the museum. It’s a steep road in places and there is a drop off point to unhitch a van before the road starts to climb. Water is from Artesian Bores and really stinks of sulphur, but once you let it sit the smell goes. It is hot when it comes out of the tap and in one place near Winton, at Castle Hill Station, it is 99°C out of the ground. 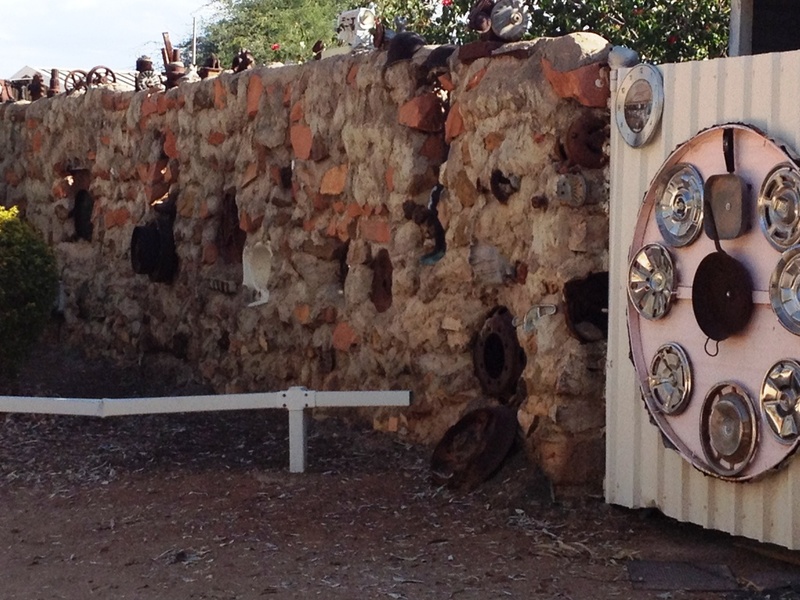 In Winton they cool it from 83°C to 44°C before it enters the town’s water supply. 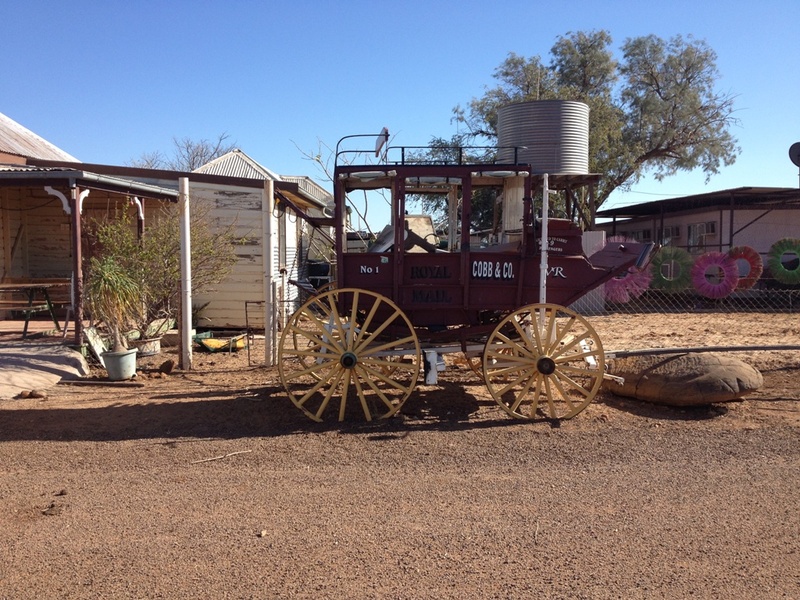 There’s a lot to do in Winton and the people are friendly and welcoming, but it was time to move on so I packed up and headed towards Longreach, planning to stay about 25kms out of Longreach so I could go to The Stockman’s Hall of Fame the next day. The best laid plans…….. Categories: Camping, Travelling | Tags: Australian Age of Dinosaurs Museum, Banjo Patterson, campervan, campervanning, campervans and motorhomes, camping, Cawnpore Lookout, Corfield & Fitzmaurice, Deborah Conway & Willy Zygier, dinosaur stampede, free camping, free camps, Lark Quarry, Middleton Hotel, Musical Fence, Solos, the Big Deck Chair, The Long Waterhole, travelling, Waltzing Matilda Centre | Permalink. Thanks Col, glad you are enjoying my stories. I took your advice re Boulia after you called me and although it wasn’t as cold as it has been in previous years the wind just didn’t let up so my jacket was very welcome. Kept a bit of the dust off me too!